The Mount is decorated for Christmas in December, ready for groups to enjoy an early Christmas together or the main event itself. The Tortoise open fire is waiting at the end of a winter walk, as are the fires of cosy pubs in the town and surrounding villages. Winter is our favourite time of year in Purbeck. You have the beaches and cliffs to yourselves and the dogs can run free, and the sun shines more often than not and turns the sea a stunning blue or green. The steam railway runs a Santa Special train to Corfe and all the shopping streets are filled with lights. If you're feeling brave you can join in with the annual Boxing Day dip in the sea from Swanage main beach. There's plenty of room to sit down to Christmas dinner together, whether you cook for yourselves in the fully equipped kitchen or use an outside caterer. Afterwards, play one of the many board games provided, sing carols around the piano in the music room, or simply watch a film together. The smart TV has Netflix, while linked Sonos speakers in the reception rooms, with a Google Play account, mean your favourite music is instantly available to stream from the internet. 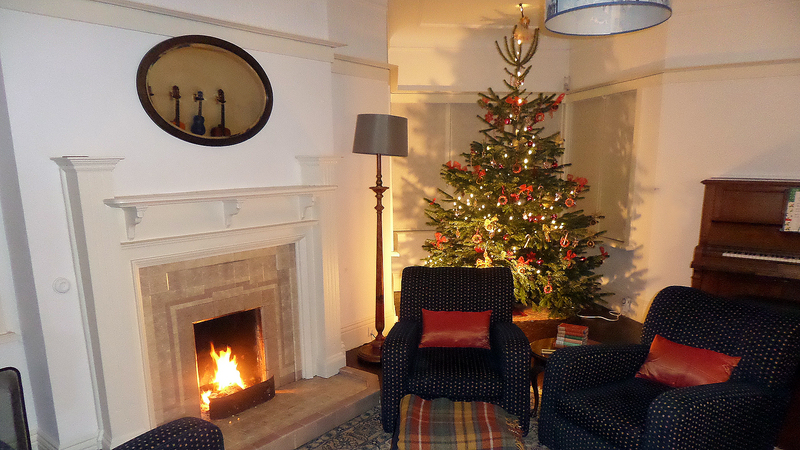 Whatever your ideal Christmas, there's space to enjoy it at the Mount. Contact us now to book your Christmas or New Year stay.